Compassionate, as ever; though one (or both) of you will have to travel just a bit for that! 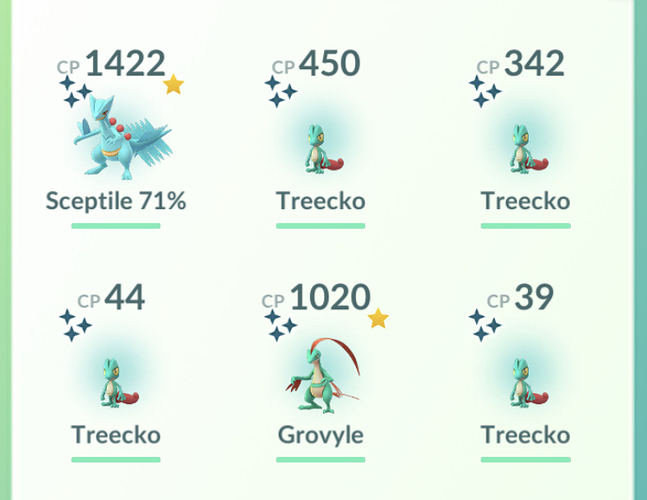 Haven’t checked all the IV’s yet, because I’ve caught over 150 Treecko, but I’ve caught 15 Shinies out of at least 300 checks. One of them has 86% IV. Sadly I didn’t catch any Hundos. It was good. Got 6 shiny’s. The first 4 had a rate of 1:10, nr 5 1:15 the last one was number 100 caught. in 2,5 hours time I caught 144 Pokémon. 105 where Treecko. 208 caught, 13 were shiny. All in all not a bad CD. Also hatched a shiny Swablu. I played for a little over 2 1/2 hours and got 2 Shinies. Luckily one of them was over 900 CP, so I evolved that one. your always able to go there? Got the three shinies I wanted and a 93.3% regular Treecko for the special move. I’ll take it. IV checking completed. 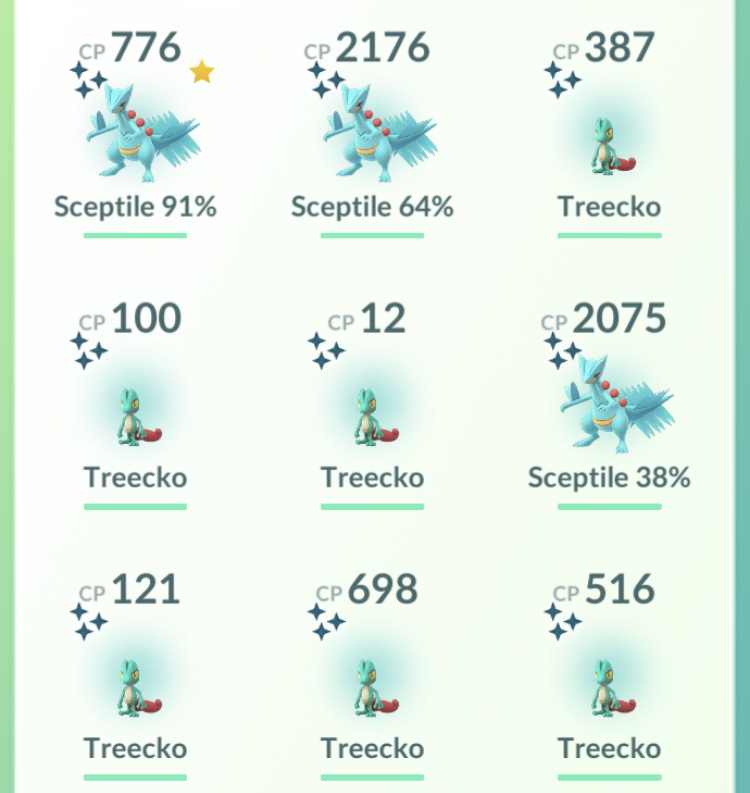 The 3 Shiny were very poor as usual. Best IV was a 596cp 96% 15attack and a 650cp 93% 13attack. Never evolved anything as I’ll never be using dust powering one up. Network was out at my usual spot the whole time, and the backup place had fewer spawns, but what spawned was pretty decent. Caught about 60 Treeckos and an equal number of other Pokemon in just over an hour, most over 60 IV, several over 80 (and 3 shinies). Also hatched a load of eggs by walking just 5 km. Evolved four Treecko over 90 IV that I had been saving, and now have a bunch of good Sceptiles with Bullet Seed and Frenzy Plant (what Poke Genie says is the best moveset). All in all a pretty good CD. Ready to get back to some raiding now. We honestly didn’t try that hard, but we both got Shinies. Despite not starting until a whole hour in–we were on errands–we both got 6 shinies each. None to write home about, but it was fun. I got 15 shinies. All but 1 have bad iv’s.